If you haven't heard about Sword Art Online, you must be living under a rock then. Sword Art Online has been all the rage across in the anime world and everyone must have at least heard of it's name. It is a great story and concept but I think it was a little overhyped. In the near future, a Virtual Reality Massive Multiplayer Online Role-Playing Game (VRMMORPG) called Sword Art Online has been released where players control their avatars with their bodies using a piece of technology called Nerve Gear. One day, players discover they cannot log out, as the game creator is holding them captive unless they reach the 100th floor of the game's tower and defeat the final boss. However, if they die in the game, they die in real life. Their struggle for survival starts now. 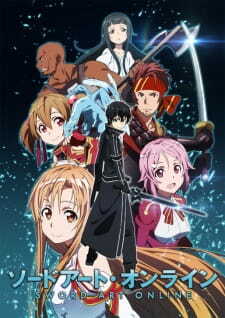 I know everyone has gone crazy about SAO and its no secret that it is one of the biggest hype of 2012. I must admit though, when I watched it I was pretty hyped myself. Why is it so interesting? The story is about a future where games can be played in a virtual environment where you are totally immersed in the game world. You can do anything you like within the game's boundaries. Here, the anime is about a game called 'Sword Art Online' in which the players play in a MMORPG-like environment. On the day of release, 10,000 players find themseves held captive in the game by the game master, and the only way out is to beat all 100 levels to the top. This is the story of their survival to beat the odds to finish the game. The story gets quite engaging, exciting with lots of cool battles and a bit of romance. You will instantly love the setting and the main character. The art was really well done and was top quality. The anime's various environments and locations all felt game-like (which was intended) and just simply stunning. Looking at the art, you can instantly tell the anime is about a game. The special effects were quite spectacular to behold. The characters looked stunning and the overall animation was quite fluid. The voice acting was also quite good; overall the characters sounded perfect and represented themselves accurately. I had no issues there. The theme songs were also quite catchy and appropriate to the overall theme. Background music and various game-like sound effects were evident and they all complemented the anime perfectly. The anime revolves around the main character Kazuto Kirigaya, a game freak that enjoys spending most of his time on his 'NerveGear'. There he meets Asuna Yuuki and a bunch of other people. At first, he goes solo and trains himself to become the strongest in the game. He ends up with some minor setbacks and accomplishments ultimately uniting with Asuna along the way. They both share a nice relationship towards the end of the series. Kazuto is portrayed as a caring and cool guy; not outwardly showing his emotions or expressions. Asuna is more open and quite lively. They make the perfect match in the end. Overall, I can see how everyone loved this anime. The story was quite good and the characters were appealing. There will be a sequel, but nothing has been announced yet. We all art waiting eagerly to see what will happen next!